Destiny has a hell of a user interface. It’s nice to look at, but like many things in Destiny it’s also nice to use. Just like any part of any finished video game, it went through a lot of rough drafts to get to where it is now. Yesterday at the Game Developers Conference in San Francisco I attended a talk titled “Tenacious Design and The Interface of Destiny,” given by Bungie lead UI designer David Candland. Given that I’m A) obsessed with Destiny and B) obsessed with video game UI in general and Destiny’s UI in particular, this talk was as squarely up my alley as a game design talk can be. Most interfaces on console games have you use the controller to bounce from selected box to selected box and selected item to selected item. 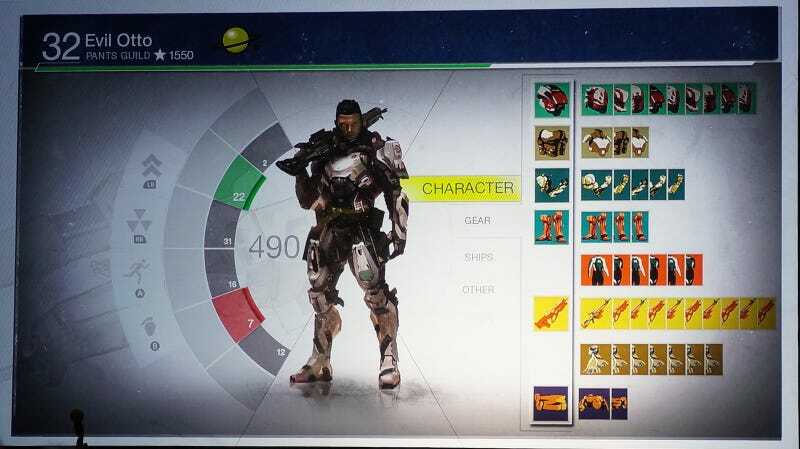 Destiny’s interface lets you freely move a cursor around, more like using a mouse on PC. Candland spent a while talking about how much work went into getting that system right—in particular, how to handle the feedback when the player’s cursor moves over an item or menu element. When you do it in the finished game, your cursor slows down slightly and the item/box bulges slightly, to impart a sense of stickiness to the thing you’re about to click on. It may not surprise you to learn that the process of determining the proper amount of stickiness required a lot of painstaking iteration. Candland also discussed the game’s icons and menu layout. He showed some early mock-ups of what Destiny’s menus could have looked like, so I grabbed my camera and took some photos of what he showed. He stressed that a lot of the items and text in the mock-ups were fabricated by the art team and had no relation to stuff that might actually be in the game. So, best not to read too much into anything you see below. These shots are in order, so they somewhat represent the evolution of Destiny’s user interface concepts leading up to its launch in 2014. Mostly I just enjoy the idea of a Cabal vendor named “Gus the Slovenly.” With no helmet! In the top right corner of the “Inventory” screen is something that begins with “Grimo.” Ah, to have gotten an in-game Grimoire. Osiris as an in-game vendor! Lines up with Jason’s big behind-the-scenes story about Destiny’s rocky development. Relic Iron is still Relic Iron, though Sulfur Bloom is now Spirit Bloom. No idea what Cometary Alloy is... maybe Spinmetal? Candland said that the partial blue backgrounds on the weapons in this draft were meant to indicate how leveled-up the weapon was. Because some weapons were so big (i.e. rocket launchers) it was too hard to tell how far along some guns were, so they scrapped the idea. Not a final version, but this one’s the closest to where they eventually ended up. Candland talked about how while iterating the broader UI, they also spent a lot of time working on the layers and art design of the icons for each piece of equipment. He showed a slide with some of the weapon and armor icons from the finished game and said he’d bet that a lot of people in the audience could name almost every piece of gear just based on the icons. The whole talk was really cool and will hopefully be streamable on the GDC Vault pretty soon. It was another reminder that video game user interfaces are extremely difficult to make, and that for all we may complain about the ones that get things wrong, it’s good to celebrate the hard work that goes into getting it right.